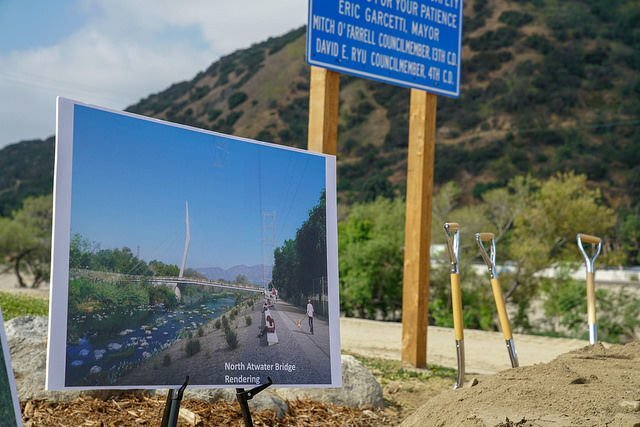 Atwater Village — Mayor Eric Garcetti and other officials held a ceremonial groundbreaking this morning for a bridge that will allow pedestrians, equestrians and cyclists to cross over the L.A. River between North Atwater Village and Griffith Park. The 300-foot-long bridge had initially been expected to be paid for entirely with private funds and was to be turned over to the city at no cost. But public monies ended up being used to pay for most of the structure as estimated costs tripled. Landowner and philanthropist Morton La Kretz pledged $4.75 million for the bridge when officials announced plans for the structure in 2011. That was supposed to cover most of the bridge’s cost. However, the most recent estimates indicate that the bridge will cost more than $16 million, leaving taxpayers to pay for the rest. The cable-stayed bridge is expected to be completed late next year. 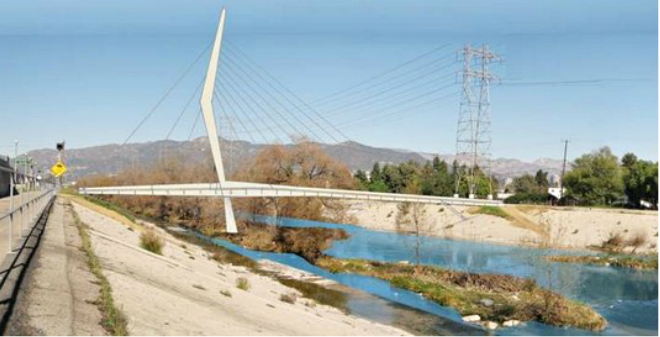 A section of the L.A. River path was closed last month as workers began to prepare for the bridge’s construction.